After downloading the document above, use the links below to help you research and discover individuals working within the Federal Government. Project Description: You are responsible for working together in groups of 2-4 to Roast a President. A "Roast" is defined as - an event, in which an individual is subjected to a public presentation of comedic insults, praise, outlandish true stories (with historical relevance and accuracy), and heartwarming tributes as a mock counter to a toast. All president make mistakes, bad decisions, and in some cases criminally overstep the boundaries of our laws. You are responsible for roasting a US president. In doing so you may add in comedic anecdotes, images, or quotes. Be sure your commentary is relevant, interesting and witty. You are not expected to tell the life story of a heroic and moral President, but you are expected to find information relating to mistakes and flaws we can look back and laugh about relating to the administration and the legacy that we remember looking back. Roaster vs. Roastee- Roasters are those making the witty comments and remarking on the president being Roasted = Rostee. In addition, Roasters may want to play the role of a friend, Vice President, wife, or even son or daughter. This could make the speech more personal and meaningful than a stranger who is making wild accusations and attacking the President. Once the Roasters have spoken, the Roastee can comment on things that were brought up as a light rebuttal, genuine acceptance of flaws, comedic apology, or hilarious denial. Selecting a President: Use the available link. Talk it over with your partners and choose from any President before the Reagan Administration. You will need to make sure that you have read enough about this president to be convinced that they are in fact the worst President. Some presidents have a darker past, while others may blatantly lie, cheat and steal, and make the mistake of getting caught. Researching: Once you have read through the background information from the link, you will need to expand on a specific event, or a few events for your portion of the roast. Be sure that you have divided up the content with your group and are not repeating topics. Roasting- A few tips for your roast. Tie their experience to something relevant in popular culture that everyone will connect with. Consider celebrities and current events. Use similes and metaphors when comparing their actions and behavior. Imagery, weather an actual picture you project or create, or a well illustrated image people can visualize will make the content more memorable, funnier and often times more legitimate. Steps to writing a Roast (download the "Roast" document below). Write Up: Each individual is responsible for writing their own 4 paragraph explanation of why this President is one of the worst presidents in History. This should be entirely factual and formal, separate from your roast speech. You will need to find enough factual content to generate commentary and argue your position. This is not a purely factual narrative essay of their life, you are developing your commentary in the most convincing way possible to sell the idea that this was in fact the worst president ever. 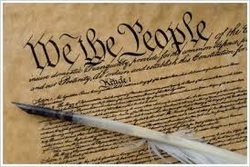 Homework due 3/28: Complete an outline of articles 1, 2 and 3 of the constitution, as instructed in class. The oultine is available bellow to download in case you have lost it. 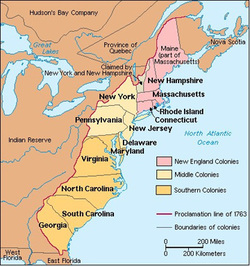 Use the above link to research the 13 colonies. Develop an understanding of why the colony was established. What the significance of the colony was, and who might have contributed to the growth of the colony or its unique culture. Once you have completed The 13 Colonies chart outlining each colony, you will be assigned a colony. Create a word cloud that demonstrates your understanding of the colony and its inhabitants. The shape of your cloud should resemble the shape of the colony. Once all of the colonies are completed, you will create a colony profile. Use your computer to complete extra research to clarify or expand on topics related to your colony! Draw or trace an the border outline of your colony to mark the shape of your word cloud. Brainstorm and consider what words might be used. Do research using a computer, be sure to avoid illegitimate sites! What kind of colonial government was established? Famous Historic people or groups? All colonies were expected to establish a charter from their parent country as a new colony. This charter would establish a set of legal boundaries for the colony to exist. In addition, they were expected to have this Charter approved by the King of their parent country!!! How would you develop your colonial charter? Consider the desires of your population and the interests of your King. Outline in multi-paragraph form exactly what your colonial charter would look like. Your King will review it and determine if it is representative of his interests in your new American colony. What kind of government will be established? Be very specific about roles of individuals in government and their relationship to the parent country! What religion will you establish? How will you address violations of the law? Will you establish a military or some militia? How will you make amendments or changes to your Charter? The fore fathers of our nation were constantly bickering over the plaguing issues related to our country's early development. 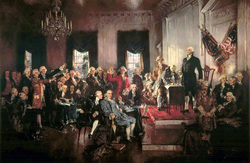 The issue of dependence, followed by the Articles of Confederation, and the ensuing Constitutional Convention, lead to a great deal of writing, persuading, and illuminating that resulted in our existing U.S. Constitution. Use the following pages to learn about our forefathers. You will be responsible for creating a profile relating to a significant delegate/representative of the Constitutional Convention. Then, you will participate in a forum, as that delegate, that allows you to comment on the convention each day before you go to bed each night. Address comments made by other delegates, your opinions about the decisions made, and suggest ideas for bettering this constitution. All of this must be done from the specific perspective outlined in the profile of your delegate. Lastly, you will be given the opportunity to comment yourself, from your own perspective as a future time traveler. Develop a Profile: Choose from one of the forefathers listed. Now that your profiles are finished, listen to the instructions from the teacher as you are carried through these various stages of the Convention. Feel free to explore the links below to find out what is happening as the convention ensues. Act 1: Be sure to find the following topics of discussion. Understand both Federalist and Republican perspectives and how compromise was reached. Be sure to identify the perspectives of specific individuals. Act 2: Review the following terms and be sure to read up on their supporters and opponents- Too many to mention! Today is your last day to post on the profiles of our Forefathers, embrace this special opportunity you have been given! Now that you have come to know the perspectives of our Fore Fathers, you will be asked to conduct an interview. The interview can take on many forms, as interviews tend to. See the interview options below along with the Interview Expectations. Critical and Hostile- Constantly attacks the persons opinions, questions their facts and perspectives, and inquires about scandals and other topics that may be embarrassing, shameful or otherwise damaging. Promotional and Friendly- Addresses topics that shed a positive light on the individual. Benefits politician for reelection, overall legacy and seeks to build popularity. Subjective and Impartial- Temperament of interviewer and interviewee may fluctuate escalate or otherwise evolve with the topics being discussed. Neither the interviewer nor the interviewee have stake in the agreement to hold the interview. All questions must be written and submitted before the interview date. In order for the team to receive full credit, all of the following criteria must be met. Minimum of 2:30-5:00 minutes in length. 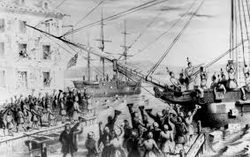 Demonstrates the life, historical period as well as the perspective of the individual as it relates to the American Revolution-Constitutional period of history. Refers to relationships developed, conflicts, confrontations, and obstacles faced. Research extensively and document all content from the interview by footnoting responses and using a sources page: You will be shown how in class. Must use a minimum of 7 sources!!! Develop strong interview questions that allow for detailed and descriptive answer that will interest and even entertain those watching. Weak Question- What year did you begin fighting in the Revolutionary War? Better Question- What was it like when you began to fight in the Revolutionary War? Great Question- Explain how you became involved in the Revolutionary War?